Ebanos Crossing with head bartender Gia St. George host A Living Room Affair, a semi-regular series on Wednesdays with guest bartenders, live music and art. 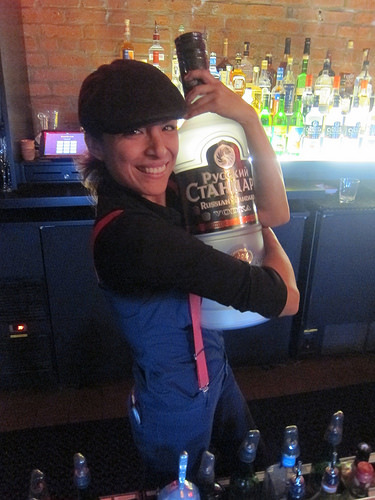 I recently checked out Ebanos Crossing when Russian Standard Vodka took over the bar with guest bartender Billy Ray from the new EightyTwo and Formosa Cafe. The next event is tonight, Wednesday, February 26 with Alex Straus (Grandpa Johnson’s– forthcoming) from the Bon Vivants. 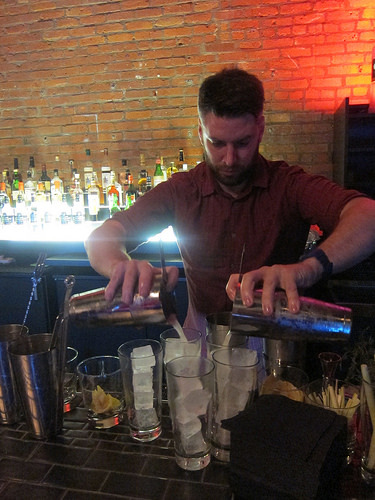 He’ll be serving drinks with Tequila Ocho, Pierde Almas Mezcal and Mandarin Napoleon. A cross between a vodka soda and beer cocktail, the Tiger Blood by Billy Ray would be a great brunch drink. The live band was really great and we enjoyed looking at the artist working near the “living room” of Ebanos Crossing. It all added to the festive atmosphere of the event. For a boozy “martini” style drink, the Pear-fection was a great one from Gia. 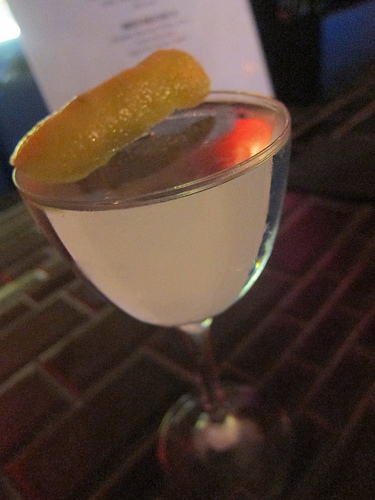 We liked the Thai basil infused vermouth and a touch of sweetness from the pear liqueur. Probably one of my favorite types of drinks is a sour. 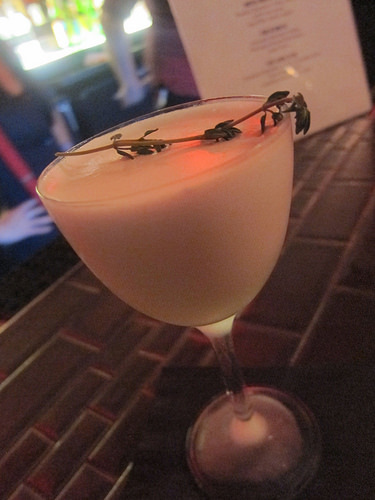 The Rooster Named Thyme from Billy Ray is a vodka sour with a lovely white rose syrup. The froth was absolutely perfect. 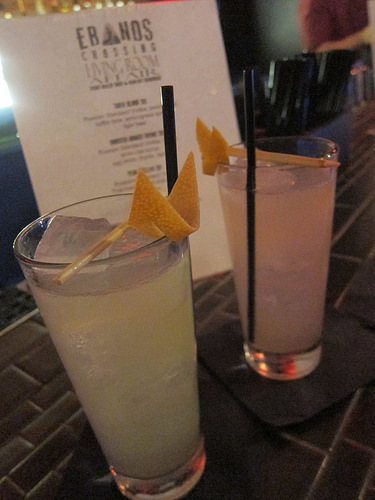 I can’t wait to see what Gia and guest bartender Alex Straus get up to tonight with tequila, mezcal and more! This entry was posted in alcohol education, alcohol tasting, bar stories, bartenders, cocktail week, cocktails, events, hot bartenders, la, la cocktails, los angeles, spirits, the minty and tagged alex straus, billy ray, bon vivants, cocktails, drinkwire, ebanos crossing, event, gia st. george, la cocktails, living room affair, russian standard vodka, the minty. Bookmark the permalink. Working with Gia was a treat!!!!! !